The outlines of a motif must first be pierced with the help of a template before going into detail. It is also important that the targeted selection of the details is left up to the children and they don't simply start pricking away but rather work carefully in a certain rhythm. 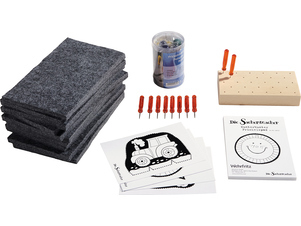 Fine motor skills and hand-eye coordination are fostered very naturally. 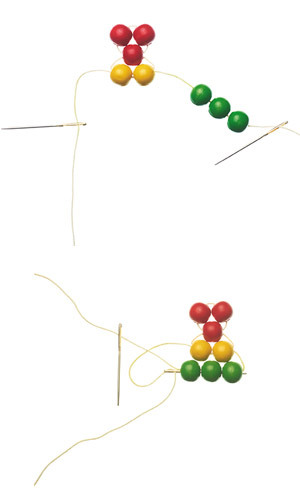 Pricking in Fröbel's terms conveys to the children not only attentiveness in handling the pricking needle but also playful basic geometric knowledge – by assembling rectangles, circles, and triangles. 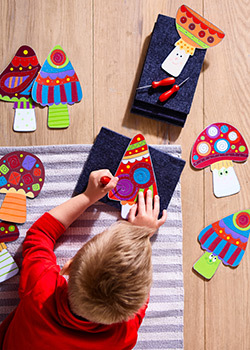 Pricking of life shapes such as animals or flowers is very popular with children. A variety of opportunities for discussions about their habitats can develop while pricking and afterward. 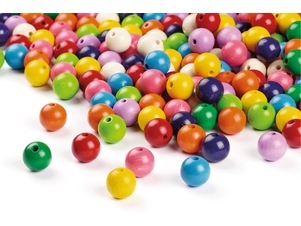 As with all the other handicraft techniques, what is important when threading according to Fröbel is neatness and a structured way of working: The beads are first arranged by colors and sorted in the material bowls. This procedure fosters in the children identifying and naming colors. Fröbel made a direct connection to nature here: He spoke not simply only of green, blue, or yellow, but rather of grass green, sky blue, or sun yellow. "Thread this way: three red, two yellow..." "...thread right, pull through left – tighten"
The first understanding of numbers is fostered by counting the beads. The work steps train spatial orientation. They are repeated several times, whereby the beads are always threaded alternating on the right and left end of the string. At the end, the thread ends are knotted. As with all threading, not only are fine motor skills fostered here but also the concept of proportions, symmetries, and sequencing. How many beads comprise the head and the body of the snake? In what sequence do the beads have to be threaded so that a certain pattern develops? And how does symmetry really work? 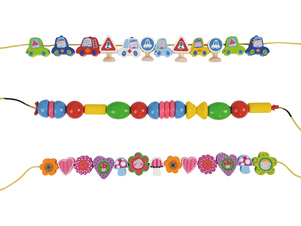 The children can find out all the answers to these question playfully while threading a "Fröbel bead snake." Because this work is very challenging overall, younger children especially will require increased help doing it.